So you are thinking about scheduling seminars to encourage employees to enroll in the company 401(k) and wondering how effective they might be. 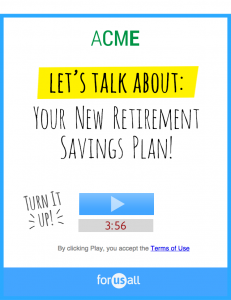 Maybe you have a new plan and you want to introduce your employees to this retirement nest egg builder. Or maybe you would like to get more employees involved with your existing plan. Maybe the participation rate is low, or employees are contributing less than you expected. Maybe your plan is having trouble passing the top heavy or nondiscrimination tests. And maybe your 401(k) provider thinks an educational seminar will persuade employees to sign on and sign up for hefty contributions. It just might work. Maybe. But the odds are against it. Though well-intentioned, using a seminar to persuade employees to engage with the 401(k) is an uphill battle. First, you have to get your employees to the seminar. Even if the event is held on location and during business hours, employees must leave their normal job to sit in a meeting filled with unfamiliar language and a task at the end of it (enrolling!). That’s not always a recipe for success, especially for employees who don’t show up. And some of those who do attend the seminar may be overwhelmed by the amount of information provided, especially if much of it is unfamiliar. But what if your seminar is hosted by a Great Retirement Plan Motivator? It’s certainly a plus to have an engaging speaker. But it’s often not the speaker who is holding up enrollment. It’s human nature. Human beings love to procrastinate. And the definition of successful procrastination is to do nothing (and not enroll). This is backed by science! Studies have shown that even when employees are motivated to enroll after attending a seminar, and even when the majority say they will enroll, only about 14% actually do. Decisions where benefits and costs are separated in time – Whether it’s dieting, exercise or investing for retirement, choosing self-control is harder when the benefits are farther down the road. When it comes to the 401(k) , choosing to wade through a cumbersome enrollment process to start saving for retirement can actually be a difficult choice. Decisions with a high degree of difficulty – Choosing investments is not easy, even for financial professionals. That’s one reason why more investment options do not always mean a better 401(k) plan. Decisions that occur infrequently – One can become a fine portfolio manager with lots of training and practice. But the traditional 401(k) asks even those with no financial background to select investments to build their retirement nest egg. That’s an astonishing request when you think about it – like asking someone to learn to ice skate by watching a hockey game. Both tasks can be painful. So how do you get employees to make a decision when so many factors are working against them taking any action? 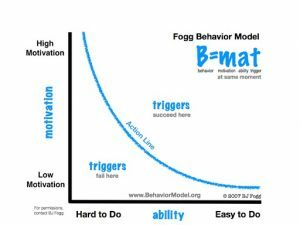 Let’s go the Fogg Model to find out. 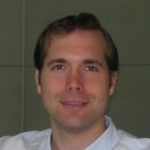 BJ Fogg is a behavior change expert and Stanford researcher. His work led him to conclude that for someone to take action they need to be either highly motivated, or that action needs to be easy to take. When it comes to the company 401(k), let’s assume that most employees are not highly motivated to sign up. If that’s the case, then companies should make it very easy to join. There’s a lot going on in this chart. But the key point for your 401(k) plan is that unless your employees can’t wait to enroll in the 401(k), making the plan easy to join should go a long way toward increasing enrollment. Now that you know the hurdles your employees face when it comes to joining the 401(k), you can use this information to make participation more attractive. That makes you a choice architect. That’s the term Thaler uses for those who influence behavior by changing a situation or environment. 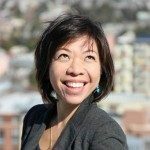 And one of the best ways to steer employees toward enrolling is to use human nature to the plan’s advantage. And one of the best ways to do that is to make many aspects of the plan automatic. **Automatic enrollment. That **means that employees don’t have to take several specific steps to sign up for the company 401k. This solves the procrastination problem. **Automatic escalation **(or step-ups). This ensures that participants boost their deferral rates each and every year. 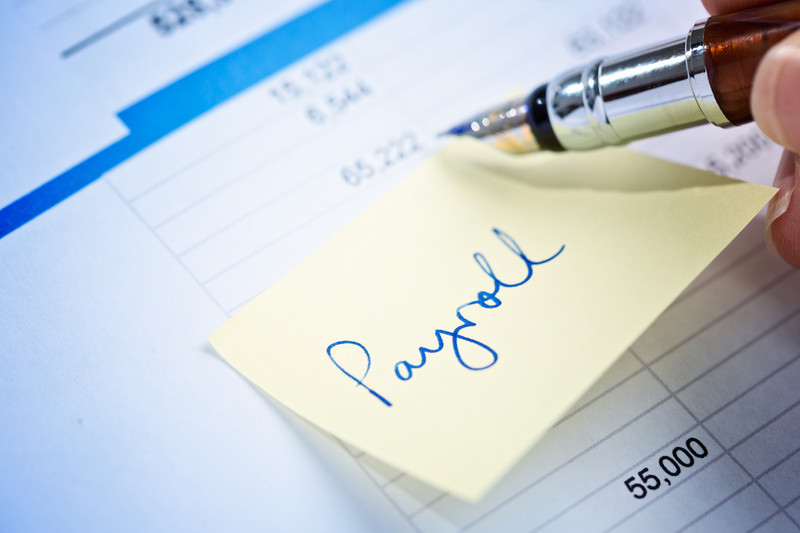 This overcomes the inertia of just keeping contributions as they are, and allows employees to save meaningful amounts for retirement. **Automatic investment. **This ensures that employees get invested rather than having their funds remain in money market instruments. Automatically investing in target-date funds goes one step further by automatically changing asset allocation. This way, 401(k) target date funds battle “status quo bias.” That’s the tendency to leave things as they are. Not always a good idea if your risk tolerance is changing and your asset allocation isn’t. These three automatic features work best when used together. Certainly automatic enrollment is an effective way to boost participation. Consider that Vanguard has compiled loads of data on small company plans where it serves as recordkeeper. What Vanguard learned is that the participation rate in these smaller plans was just 57% when there was no automatic enrollment (based on 2016 figures.). 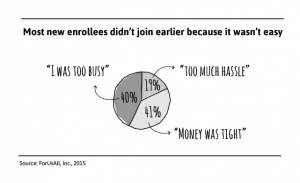 That compares to 82% in plans which use auto-enrollment. But automatic enrollment is just one piece of the puzzle. Vanguard’s numbers also show a lower median deferral rate in plans with automatic enrollment than those without it (4.2% to 5.4%). That’s because many plans set the default enrollment rate very low. Vanguard found that 57% of their smaller plans picked 3% as the default enrollment rate. Remember that inertia we talked about? Employees don’t always raise those low deferrals on their own. That’s why at ForUsAll we recommend a higher initial deferral rate of 6%, and automatic escalations of 1% each year to keep those deferrals growing. And with enrollment and escalation on autopilot, we have found that engaging communication that leverages behavioral science can keep employees interested and contributing. Here’s one communication we’ve developed that seems to do the trick (just turn up your speakers and click the play button). In this example, notice that the employee drives the action by answering questions that pertain to their own financial situation. We also took advantage of what we have learned from behavioral science by telling employees their account is already set up. That creates a perception there is something to lose by opting out. 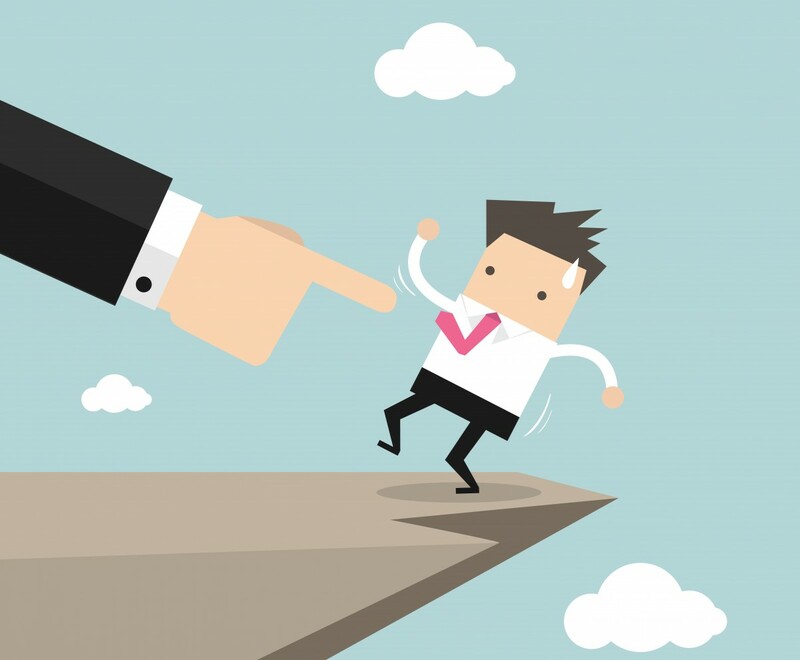 The natural tendency to stay in the plan reflects “loss aversion.” We also advise employees that the default savings rate of 6% is only a starting point. It’s not the recommended savings level, and in fact, is a below average 401(k) savings rate. This can encourage employees to save more and is a behavioral concept called “social proof”. Besides helping your employees prepare for retirement, high participation and deferral rates keep your plan healthy. That means the plan has a better chance of passing nondiscrimination tests and allowing you and your key employees to maximize tax-deferred savings. All it takes is some engaging technology, key features like automatic enrollment and auto escalation, along with a meaningful default savings rate. And, if you can do all of this without a seminar, your employees will thank you! 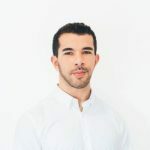 Amir made the move from the East Coast to the West Coast to join ForUsAll in its mission of giving the everyday working American a fair shot at retirement.